Keep your eyes on the prize, hold on, hold on. There never was a moment in American history more honorable and more inspiring than the pilgrimage of clergymen and laymen of every race and faith pouring into Selma to face danger at the side of its embattled Negroes. Despite the triumph of the moment, the weeks leading up to this point were filled with senseless violence and bloodshed. In January 1965, the Southern Christian Leadership Conference (SCLC), the Student Nonviolent Coordinating Committee (SNCC) and Dr. King had been campaigning for voting rights in Selma. Despite repeated attempts to register to vote, only two percent of the local black people had managed to do so. Police brutality was common in the region, so it was hoped that national attention would be drawn to the cause, and new voting rights legislation would be enacted. At first, there were many arrests, but little violence. But then, on February 18, a policeman shot a church deacon, Jimmie Lee Jackson, who was trying to shield his mother from being beaten by the cop’s night stick. He died from his injuries eight days later. In response to Jackson’s death, activists first set out to march from Selma to Montgomery on Sunday, March 7, but were ordered to disperse by State troopers and local law enforcement. When the marchers refused, the officer in charge ordered his men to advance, and the group was attacked with tear gas and clubs. Police on horseback pursued those retreating and continued to attack them. When these events were televised, it sparked national outrage, and made Governor Wallace, Selma and the state of Alabama look pretty barbaric. King and his fellow activists planned to retry the march on the 9th, but when the crowd reached the Edmund Pettus Bridge, the site of Sunday’s violence, King stopped and requested that everyone kneel and pray with him. They turned around and headed back to Selma, avoiding further confrontation with the police. Not everyone agreed with King’s restraint, but it gained him the support of President Lyndon Johnson, who had pleaded with him to postpone the march until an order for federal protection for the participants could be obtained. On March 17, voting rights legislation was submitted to Congress by President Johnson. When the march began on March 21, those taking part were under the protection of federalized Alabama National Guardsmen and the F.B.I. (the Alabama National Guard had to be “federalized” because Governor Wallace refused to spend state funds on protecting the marchers.) The federal judge who approved the demonstration (an old friend of Wallace’s, no less) ordered Wallace and the local police not to harass the marchers. Once more the method of nonviolent resistance was unsheathed from its scabbard, and once again an entire community was mobilized to confront the adversary. And again the brutality of a dying order shrieks across the land. 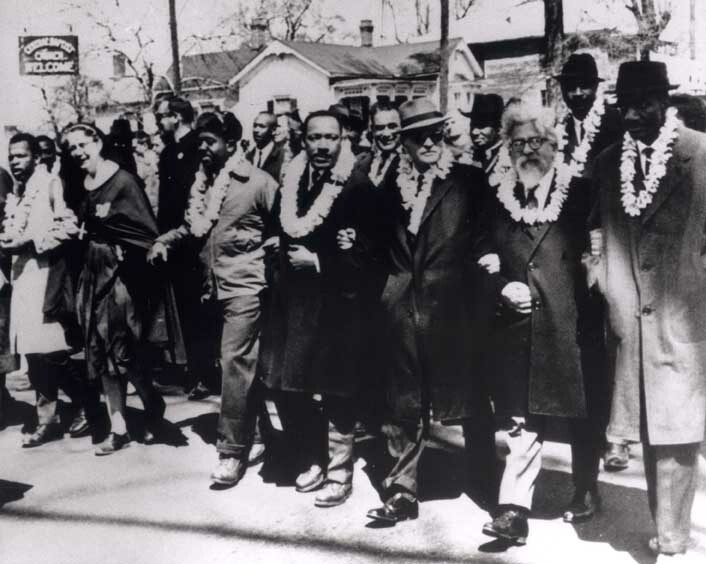 Yet, Selma, Alabama, became a shining moment in the conscience of man. If the worst in American life lurked in its dark street, the best of American instincts arose passionately from across the nation to overcome it.